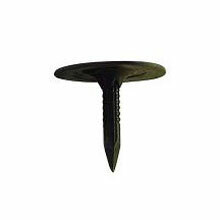 Metal Round Cap Masonry Nail is for attaching foam insulation to exterior surfaces. They are fluted to penetrate masonry without cracks. Heat Treated steel, also known as hardened steel, survives strong hammer blows.